I promised a picture of the board in the folded-away position, so here it is! The protrusion into the room is quite small - around 12", and doesn't block the window. 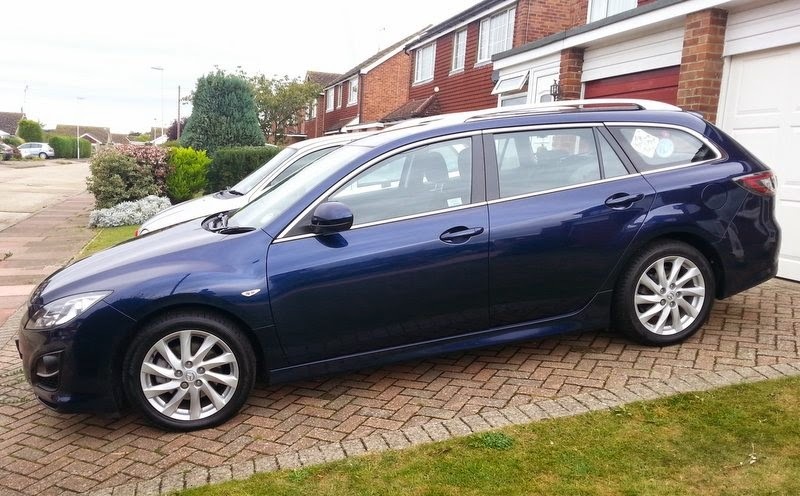 There's space for some storage underneath too, though admittedly it isn't pretty! The black strips you can see are foam pipe lagging, to soften the blow when crawling under the layout and coming up too soon! This is a close-up of the rear leg and the frame that holds it off the wall, the pivot bolt can be seen. Above it the front leg hangs, and in this picture the safety catch is not in use! So base-board done there was pressure to lay some track! 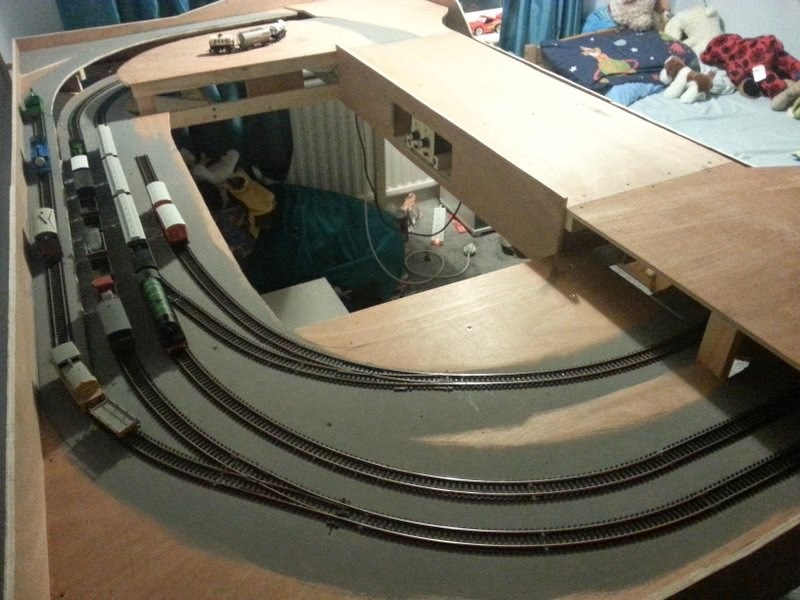 First the board was painted grey (with emulsion tester pots) where the track was to go, realistically ballasting isn't going to be high on the priority list but a grey base looks better than plywood. The end curves are 2nd and 3rd radius set-track and the points to the inner "loop" line are Hornby set-track, but the crossover and the branch to the upper level use Peco Streamline, and the straights are flexi-track. There's no 3rd radius set-track point (a major omission I think), so I used a 2' radius streamline point which is a little larger in radius but flows well. The transition between point and straight, and the inner track at this location, were laid in flexi-track to match. Laying flexi-track and streamline points takes more work - trimming sleepers and carefully lining up the rails - but the result looks better and runs well too. Much of the track came from my train-set around the loft of my parents house, it has since spent many years in their shed too, so was well tarnished, nothing would run on it. Some vigorous cleaning with a track rubber and fibreglass pencil brought back the shine and (more importantly) the electrical conductivity. 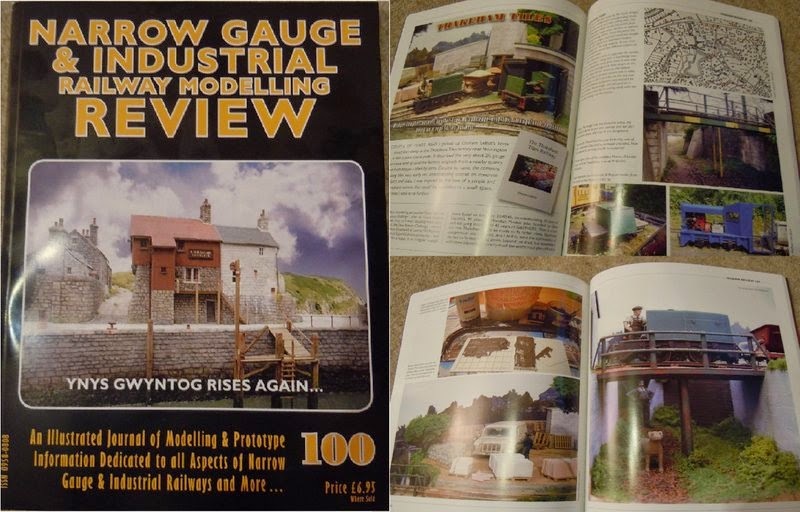 That last photo also shows the Gaugemaster double-controller set under the upper level. I wired one control to the inner track and the other to the outer track, and so we (just) had trains running by half-term! With the baseboards made it was time to assemble them together. This is not a portable layout, so they were clamped together then big screws used to fix them. I guess it could come apart in the future, though I won't be worrying about splitting track or wiring at baseboard joins as that would significantly complicate things. The front and rear profiles were cut from two pieces of ply, and screwed in place spanning the board joins, hopefully making the whole thing rigid. The next trick is to pivot the board to the wall. I made up a simple frame for each rear corner: a batten screwed to the wall with a weight-bearing leg spaced away from the wall about a foot. It is this leg that the layout is bolted to with 10 mm bolts and locking nuts. The front corners simply have a leg attached also with a single bolt, so they fold down the side of the layout as it goes vertical. 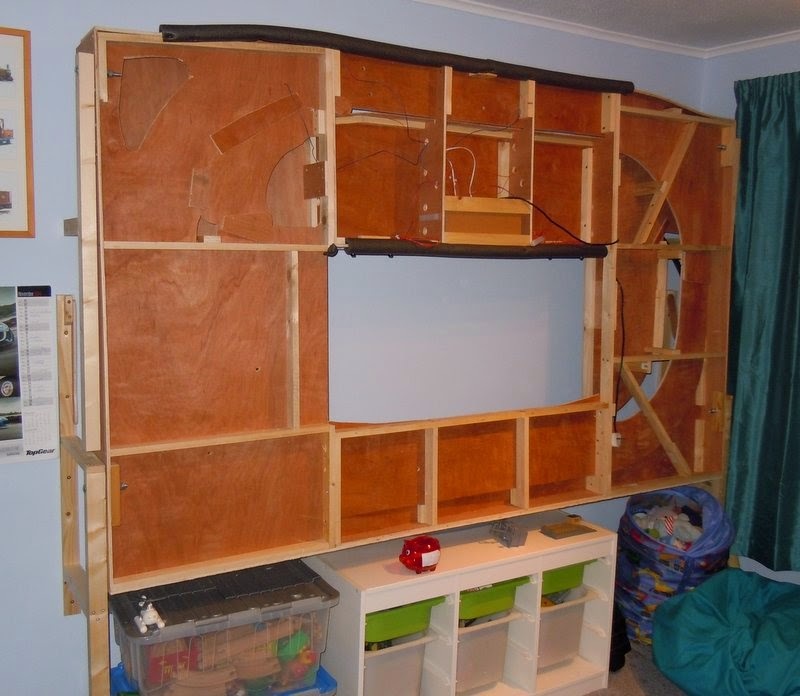 The layout down, the wall-battens can be seen against the wall but they don't carry the weight of the layout. The double-deck front part of the layout adds to the strength. Underneath the layout the step/box I made recently can be seen, allowing children to operate the layout and see what they are doing, as the lower track is about 3' from the ground. A close-up of one of the hinged bolts, which is set about 10" into the layout. The leg is in the foreground, the wall batten can be seen behind. I forgot to take a picture of the layout stored upright, and now I'm not allowed to put it away (! 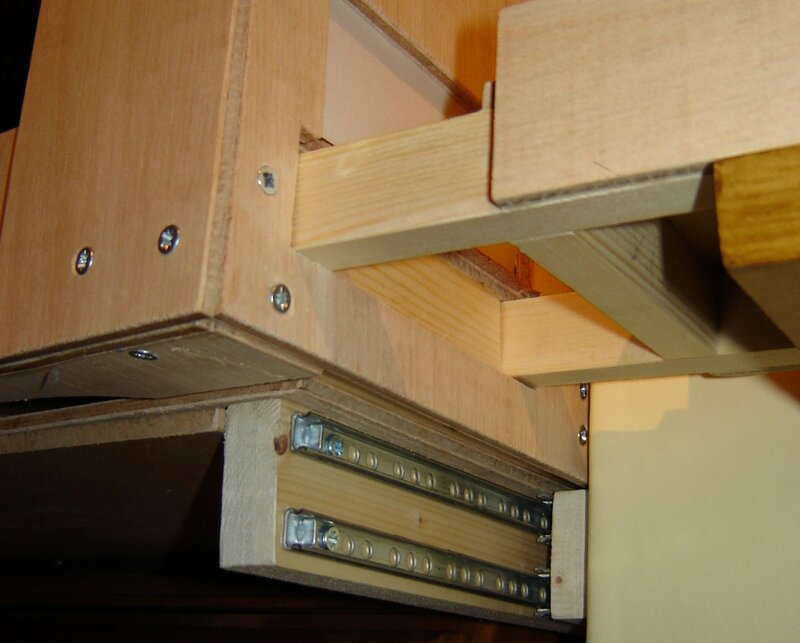 ), but as stowed the board is allowed to go slightly past the vertical so it gently leans on the wall. A pair of risers on the side of the layout, topped with a piece of felt to prevent marking, rest against the wall. The main weight of the layout goes down the rear legs, but enough weight is over-centre pushing against the wall to mean it isn't going to fall down. Nonetheless, just to make sure, a couple of catches are fitted to the wall battens. This simply pivot onto a protruding screw head at the side of the layout, and mean it cannot be pulled down. I left a cut-out under the rear of the front station board, where the station will be at a high level, and fitted a shelf. My old Gaugemaster "D" controller, which my Dad bought me for my train-set when I was a kid, fits nicely into the gap. 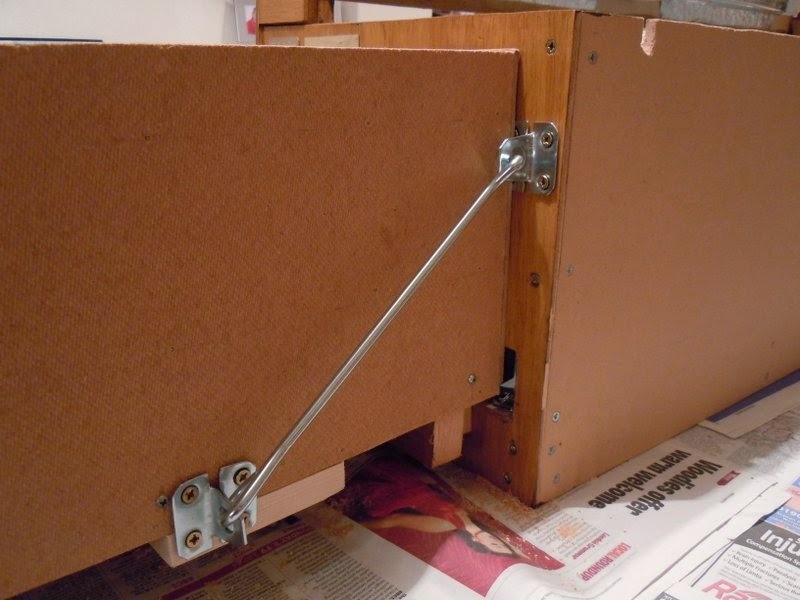 It is secured with some wood strips all round and above, and a couple of large washers. When the layout is stowed upright this is pointing down, so the washers are pretty vital! 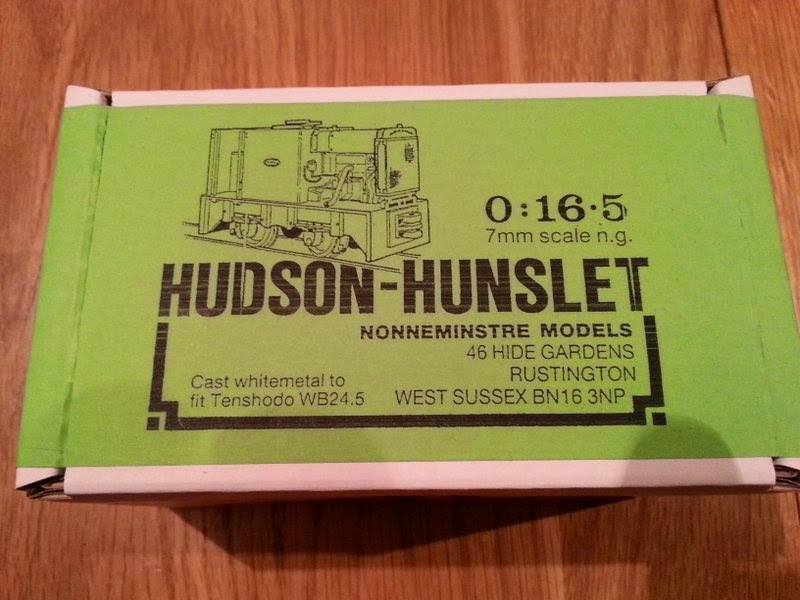 A few years ago I built a train set for my son, which folded to go under his bed. We moved house last year and in the summer I redecorated his new bedroom, and we got him a new bed - which didn't allow for the storage of the layout. 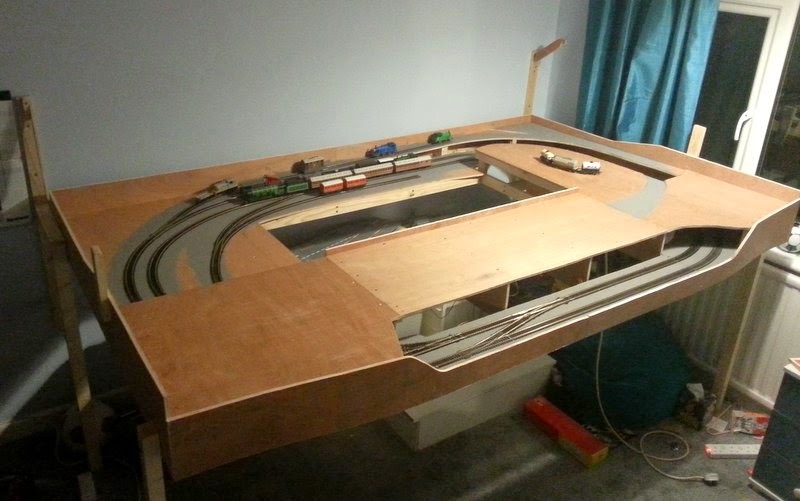 In any case he was growing out of the simple train set, and it had some limitations including an over-tight curve on the inner track, so I had promised him a bigger layout in his new room. It's ambitious but seems to work, so I got a couple of 8' x 4' sheets of 9mm Ply. I'd worked out the main board sizes I needed so I could get the timber merchants to cut it, which also meant I could get them in the car! The layout is made of 4 boards: 2 of 4' 7" by 2", one 3' 6" by 21" and one 3' 6" by 14", and all include some aspect of double-levels. Mostly cross-framing is using 2" x 1" timber but ply was used on the more complex sections, with smaller timber for screwed joints. Ply fascias on the outside are considered part of the framing, and the extra depth adds strength, while the double-deck section should add rigidity along the length of the board too. This took me quite a while, which is when I realised I'd never built a layout this large or complex before! Anyway here are the four boards laid out together, the rising line and upper section are clear. The front and rear fascias have yet to be fitted, as they will be cut in two sections and bridge the gaps between the three boards, adding rigidity. Note that the front has developed a slightly curved frontage to push the middle board out, easing the curve on the rising line and maximising the access hole in the middle. Ahead of the Uckfield show I had a couple of jobs to do for Awngate. The fiddle yard had developed a slight sag, now it attaches to the layout by slotting it's extended frame into holes in the layout frame. This was fine when the fiddle yard was a simple plank for holding a couple of cassettes, but the extension to add shelves to the back of the plank have added a significant weight. Perhaps the timber has shrunk or worn, but the result is a distinct downward slope. My solution was one of those hooks usually used for holding gates open. 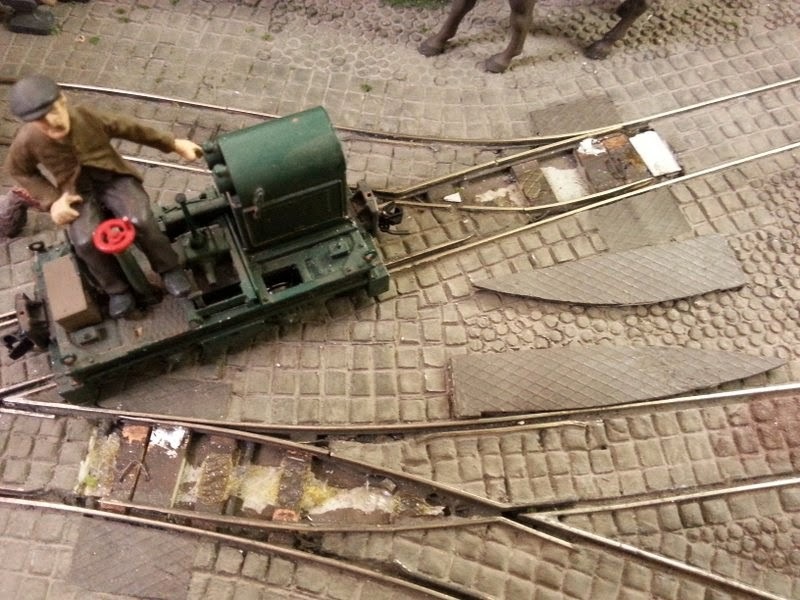 With the loop on the layout the hook is engaged to create a diagonal brace. My 7-year old son was keen to help out at the show, and I certainly didn't want to discourage, but the height of the layout (about 43" to track level) made it tricky for him to see well enough to position the trains. I did consider lowering the layout but it's enclosed presentation would make it difficult for other operators and most viewers, so a step was needed, and one big enough to stand on comfortably and move around. 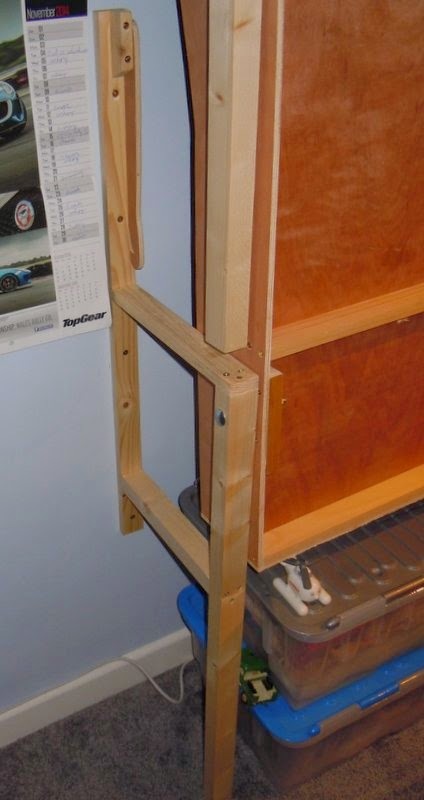 I had in the garage some melamine faced 1/2" chipboard shelves surplus to requirements. A 12" wide 30" long shelf forms the top, another shelf cut in half lengthways made the sides, and some 6" wide shelf offcuts were used for the ends. 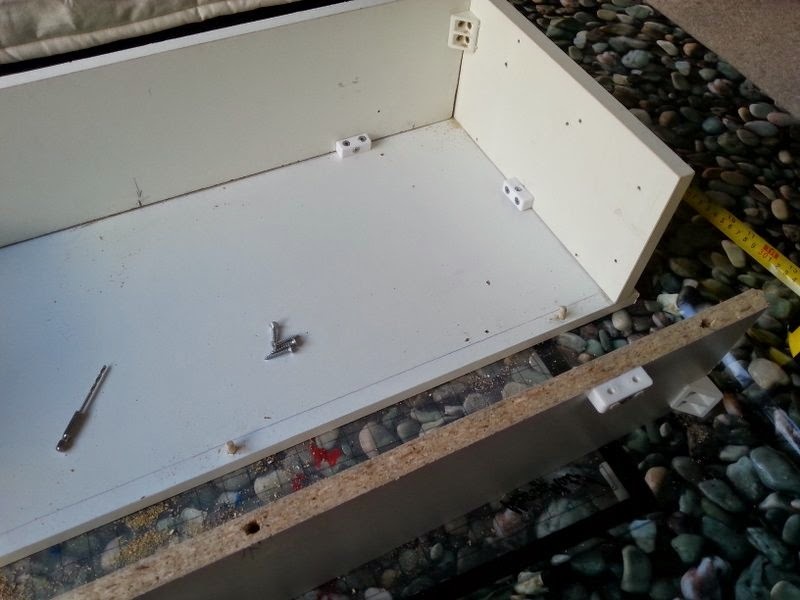 I assembled them rather like flat-packed furniture with some left over wooden dowels set into holes locating the sides to the top, and "choc-bloc" screw connectors holding it together. This means no screws showing to the outside, though I can't say it is a terribly neat job! 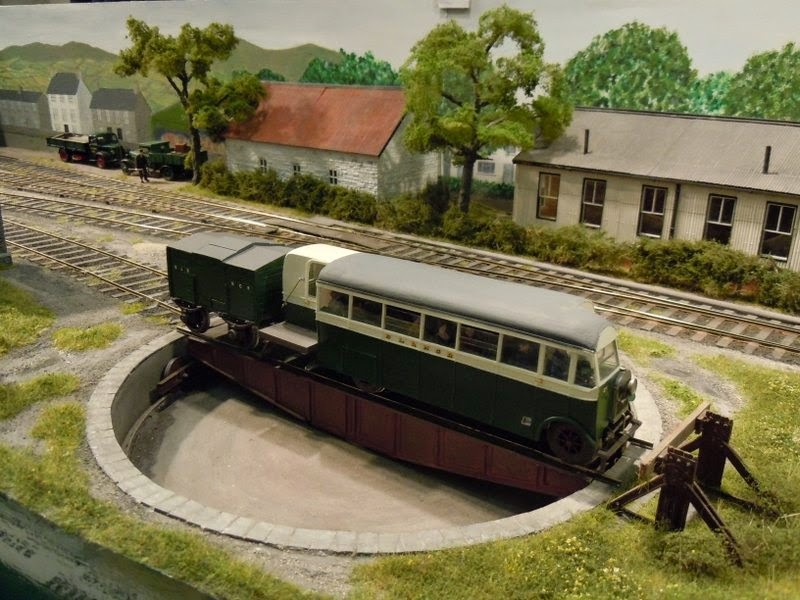 I spent today helping with the Sussex Downs 009 group layout Everleight at the Worthing show. 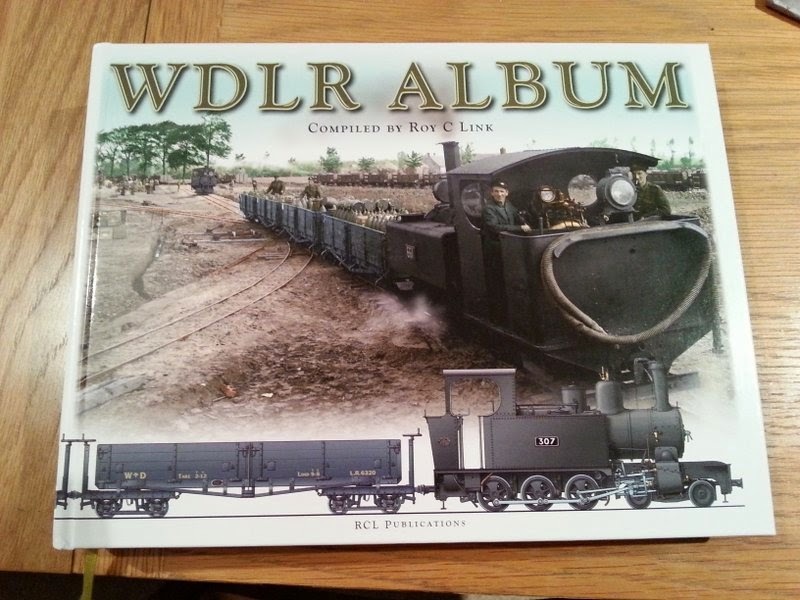 Looking around the other layouts, many I'd seen before, but I did notice some nice well observed details. For example the kids racing go-karts on this US outline HO layout. The OO layout "Earls Court" has some of the best modelled shop interiors I've ever seen. 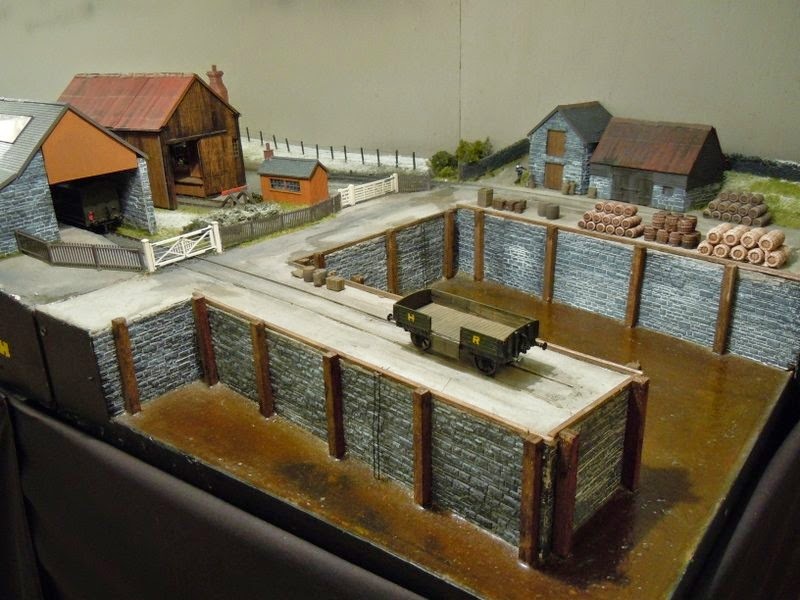 The section of the club layout we brought included Upsands Quay and the quarry. This layout was built over many years and sections are nearly as old as me, which did show with some niggles in the morning despite testing over the last three club-nights. 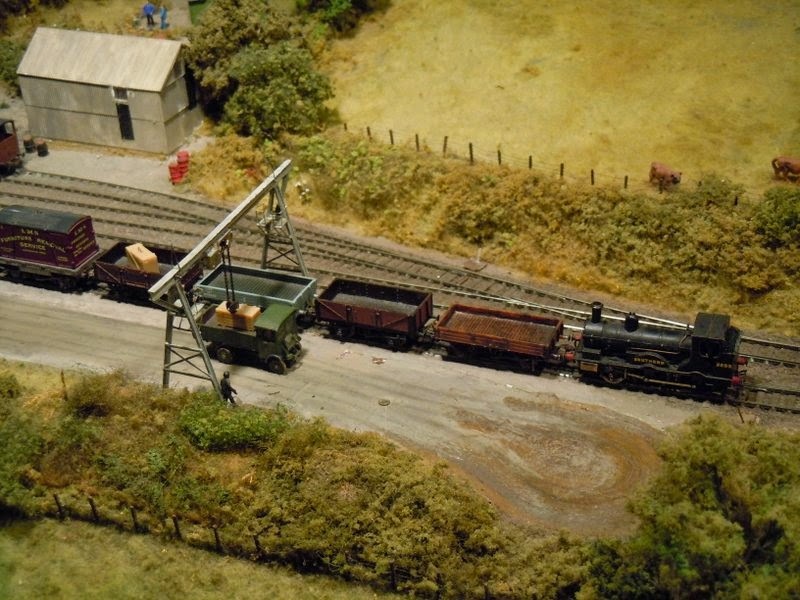 It's not the easiest layout to operate either, however the scenery and detailing are excellent, and it did seem popular with the public. The show definately seemed busy, until around 4 when the numbers dropped off significantly. By 4:30 things were starting to get silly, when John Reeve decided to test run his 3D printed South African train (the coaches as yet unpainted). Here it is entering the tunnel at Gryndene Halt - however before reaching Upsands the chimney stuck on a low point, and on reversing out, the cab caught on the tunnel mouth. Eventually we had to lift the hillside to extract the loco! The Sittingbourne and Kemsley is a railway I'd been keen to visit for a long time, so we took the opportunity on the way back from our weekend in Kent. It doesn't start very promising, the car pack is stuck between a fast food restaurant and a retail park, and the station is approached under a dilapidated viaduct and round the back of a car wash. To add to the "atmosphere" there was an overflowing sewer! Things improve when the train arrives though. The Kerr-Stuart loco "Leader" is beautifully kept, as are the coaches made from converted wagons. The route sets off over the famous concrete viaduct, and though somewhat industrial surroundings, then moves into a more rural area before ending at Kemsley Down. There's no public access here as it is still inside the grounds of the paper mill which the line was built to serve, but there are engine sheds and workshops full of interesting things - most of the locos are original to the line, though a few small diesels have been added. It looks like a lot is being achieved, and other than some heavy overhauls everything appeared in good shape. The atmosphere is nice and relaxed here, with simple rope barriers to separate public from machinery, but otherwise there is a lot of freedom to look around. A small gift shop, cafe and picnic area mean it would be worth hanging around and waiting for the next train, but we didn't have time. So a short but enjoyable visit to a line full of character, even if it doesn't fit the mould! You can see the full set of photos from both lines here.